"Who Else Wants To Plan Their Perfect Wedding Day Like A Professional... Without It Costing An Arm And A Leg?" Discover the insider secrets to saving time, stress and money while planning your wedding, yet still have the wedding of your dreams... even if you have never planned an event before in your life!! AND BEST OF ALL... All of this information, including over 150 money saving tips... piles of photo's, charts and tables... and piles more tips and techniques for getting the absolute most out of your wedding planning experience... can be downloaded to your computer within a few minutes!! his is the most exciting time of your life! You’re looking forward to a lifetime with the one you love … but there’s one challenge to hurdle first: planning the perfect wedding. You have an overwhelming number of things to do: details to keep track of... deadlines to keep... invitations to send... where do you even start? That’s where our Master Wedding Planning Guide comes in. Just consider it your personal wedding planner. Our checklists will take you through everything you need to do for the wedding. You won’t have to worry about forgetting anything … leaving something until too late… not asking the right questions... making an etiquette mistake... paying too much... and piles more! We can share with you HUNDREDS of time- and money-saving tips—so that you can focus on the most important aspect of the wedding... your and your fiancé’s happiness! 100% Guarantee: We personally offer a full refund, so if the package doesn't match up to your expectations then just email me for a full refund anytime within 90 days. Thanks for Signing Up to My Wedding Planning Newsletter! A confimation request email will be sent to your email inbox shortly. Please follow the simple instructions to confirm that you would like to receive your free subscription to "The Master Wedding Planning Guide" Email Newsletter. We employ a strict "double opt-in" confirmation procedure in our Newsletter subscription process, and never send mailings to an address that has not confirmed a subscription request. You can unsubscribe at anytime, simply follow the link at the bottom of the newsletters. Your email address will never be given out to any third party. We know how hard planning a wedding can be. Wouldn’t it be nice to know that you have everything covered? With our guide, you can feel as if someone is at your side, showing you each step and giving you the tips that will make your wedding special… seamless… photo-perfect … and easy on the pocket. That the most inexpensive time to purchase an engagement ring is March? That most stores offer a 10-15% discount on any gifts purchased for you by your wedding guests if you have a gift register at that store? That your hair style should suit the back of your wedding gown? That a bit of gel smoothed over your brows will keep them shaped perfectly for wedding photos? What percentage of the total wedding cost should go to the reception? To the bridal gown? To the honeymoon? I give you a complete budget breakdown! You can get our Book Instantly … No Time Wasted Shopping or Waiting for Mail! Because We know how busy you are, We're offering our book as a FULLY DOWNLOADABLE PACKAGE. You can save time by ordering online. All of our great tips and insights can be downloaded to your computer within 4 minutes! Because we are so sure that our Master Wedding Planning Guide is exactly what you need to make your wedding a joyful—not stressful—occasion, we would like to make you a special offer! As we mentioned this special price is part of a marketing test and is only valid until midnight Saturday, April 27th. This special offer may not continue after this date! Order And Download In 4 Easy Steps! Get redirected to the download page. it's Yours Risk-free for an Incredibly Low $19.95 (normally $49.95). Note: This Offer is Only Valid if you Order Online by Midnight Saturday, April 27th. Shipped to you Anywhere in the World! ClickBank and 2Checkout are our Authorized Retailers for The Master Wedding Planner. Both of these companies utilize the strongest security and anti-fraud features available on the Internet and never store your financial data on their system! Your credit card data is passed directly to the bank and no one but the bank has access to your sensitive information. That's right! 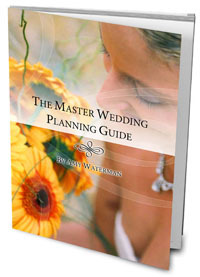 Take up to 3 months to examine and use the wedding planning and budgeting information, tips and techniques in "The Master Wedding Planning Guide". That’s up to 90 days to put these valuable strategies to work on your wedding planning in your own home. But, if you aren’t satisfied for any reason, or it doesn’t live up to your expectations, you won’t be out one red cent. Just send us an email and I will refund your payment. Right up to the final day of this 90 day guarantee. P.S. With Every Order... You'll also get the Following 5 Bonuses Completely FREE! ...But only if you Order Before midnight Saturday, April 27th. Are you looking for a way to shed those unwanted inches before your wedding day and don’t have time for a crash diet? Do you want firm, toned skin glowing with healthiness? Do you want to get rid of annoying aches and pains, and improve your mood? If so, this bonus book has the inside tips you’ve been looking for! Use the ancient natural remedy of a therapeutic body wrap to beautify, purify, and release the natural radiance of your skin. By eliminating toxins from your body, you will actually lose unwanted inches without dieting, without fasting, and without harming your body! At a salon, a body wrap can cost you up to a hundred dollars, but we show how to do it yourself with easily purchased ingredients and step-by-step instructions. With the recipes in Body Wraps Uncovered, you’ll learn ways to reduce the appearance of cellulite, eliminate aches and pains, improve your mood, moisturize and tone your skin, and lose inches from your waistline. You’ll even learn how to use aromatherapy to develop your own unique body wrap specially designed to suit you! You’ll get all the inside tips and techniques that the professionals use … all in this free bonus book! Best of all, after a few simple applications the inch loss will last for months! Super Bonus #2– “Bridal Showers to Remember”: Another great gift for the maid of honor. The bridal shower is a HUGE event for the bride and this special report will give the maid of honor the inside information on how to make it truly memorable. Super Bonus #3– “The Bachelorette Party”: Want the maid of honor to throw you the best bachelorette party ever? Well, she will, once she discovers the scores of ideas, themes, gifts, food, drinks, etc in this special report. Super Bonus #4– “Wedding Music with Distinction”: Have you started thinking about what music you should be playing at the ceremony or the reception? This special article gives you 100’s of traditional and contemporary songs that you can use to light up your wedding day. Super Bonus #5– “Stressbusters”: Use the techniques in this special report to calm the wedding day nerves, keep a lid on any potentially stressful situations and maintain the peace between yourself and your loved ones. P.P.S. Don’t forget that your order is 100% SECURE and 100% GUARANTEED!